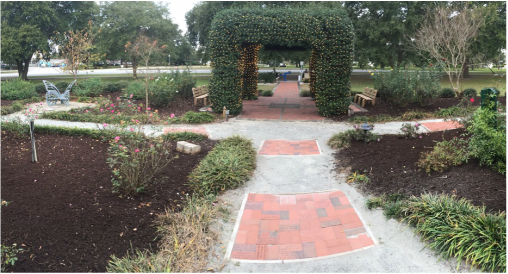 Harbor Way Gardens, located on the west end of Wrightsville Beach Park, is one of only three public gardens in New Hanover County (the Arboretum and Airlie Gardens are the other two). The one acre garden has become an oasis from our island heat and a quiet place to reflect and enjoy native plants and flowers. Harbor Way Gardens is also the only public garden in North Carolina to have Witherspoon Roses, thanks to a generous donation from an island resident. The arbor leading into the garden is often decorated for holidays and special events, and greets visitors coming over the drawbridge. The garden also hosts our Plant it Pink Garden, a reflective retreat filled with plants that burst with pink blooms to celebrate and honor breast cancer survivors. 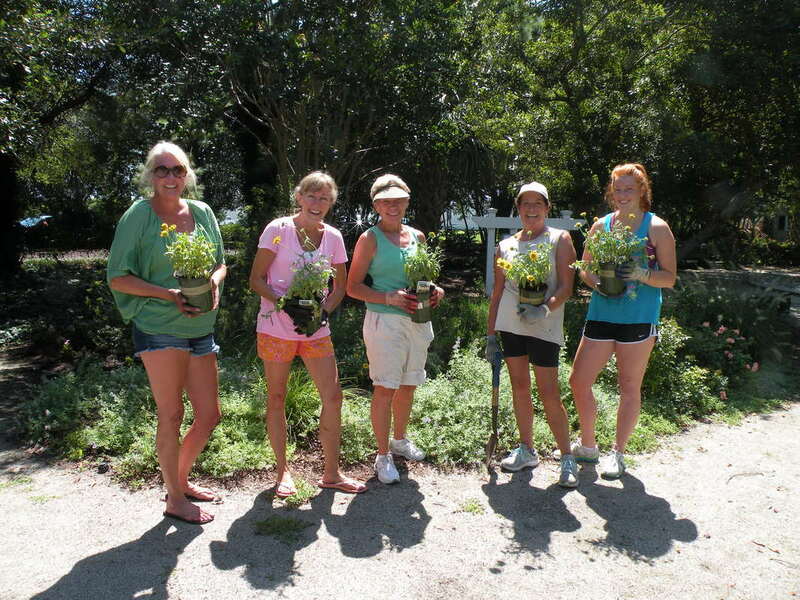 Club members maintain the garden and provide new plantings throughout the year. We invite you to stop by anytime you are in town. Check out our new official club flower: The Gaillardia. We've planted plenty in the garden. We are proud that Harbor Way Gardens has been certified as a Wildlife Habitat by the National Wildlife Federation. Now you can visit the garden anytime, anywhere! Aerial Images ILM created this amazing video for Harbor Island Garden Club. We hope you enjoy this aerial view of Wrightsville Beach Park, Harbor Way Gardens and Wrightsville Beach. Plant it Pink Garden: Celebrating breast cancer victims, survivors and their loved ones. Hope Blooms "Plant It Pink" Awareness Garden at Harbor Way Gardens. 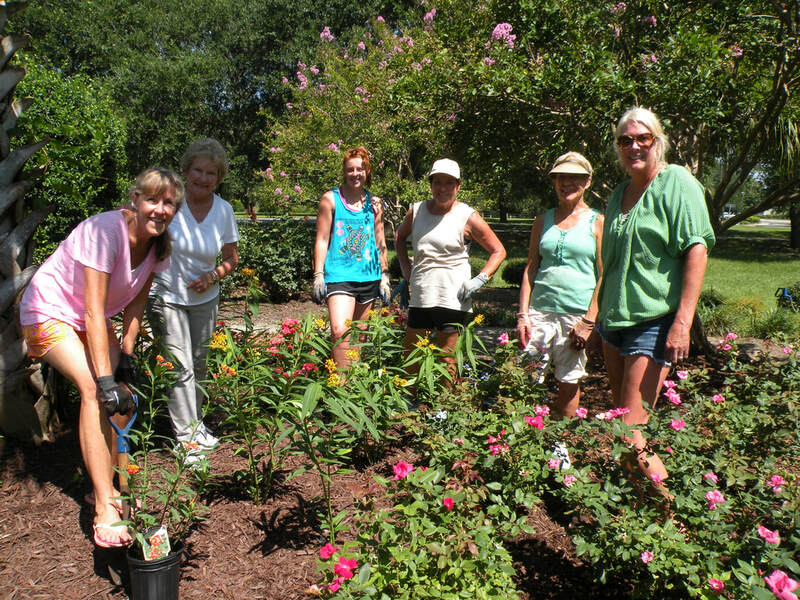 It takes an army of garden club members (and spouses), Town of Wrightsville Beach employees, community donors, and volunteers to keep Harbor Way Gardens and the Children's Fountain blooming and beautiful. You can add your support by buying a brick or paver engraved with a special saying or in honor/memorial of a friend or family member. All proceeds support the Harbor Island Garden Club. A special thanks goes to Mirimichi Green Express LLC for their generous mulch donation. Check them out online at www.mgpros.com. In 2012, Harbor Island Garden Club dedicated the Children's Fountain in Harbor Way Gardens. The multi-spray fountain provides much needed relief from the hot North Carolina heat and a calming place to reflect. Kids of all ages can run through the reclaimed water spouting from the ground most days of the year. Please consider buying a brick or blue stone paver to memorialize a loved one, remember the good times, or celebrate a special event. The bricks and pavers are installed around the fountain and on the pathway leading through the garden. Click here to purchase a brick or paver online. Kids play in the Children's Fountain. Club members celebrate the 2012 opening with a ribbon cutting. Help us raise money for the garden and show your support. Purchase a t-shirt today. Available in adult and kids sizes in several colors. Click here for more information.